Purgatory GC, a spectacular Ron Kern design just outside of Indianapolis. Indianapolis, Indiana is one of the finest sports cities in the Midwest, let alone the nation. As home to the Colts, Pacers, NFL Combine, Indianapolis 500, and Brickyard 400 on the NASCAR circuit, there is always a major sporting event going on in Indiana’s capital city. In terms of golf, Indiana’s largest city has you covered thanks in large part to the 16 courses located in nearby Hamilton County. MGM once again had the privilege of hamming it up in Hamilton County this August and offers the below suggestions for your itinerary. MGM tries to never bury the lead so here’s a cool fact – Hamilton County is the only area in the state that is home to three courses on the iconic Pete Dye Golf Trail. The Fort, Plum Creek, and Brickyard Crossing span the design acumen of the now 90 year-old Indiana native Dye and all are three absolute joys to play. Brickyard Crossing can best be described as a convergence of two iconic sports. Tucked inside the most revered race track in the world, the Indianapolis Motor Speedway, are four superbly crafted golf holes that make an already amazing experience otherworldly. If you tee it up before late May you might have the chance to play holes 7 through 10 with the deafening roar of Indy 500 practice in the background. The other 14 holes are no slouches either, as its parkland setting belies the fact you are in the middle of a metropolis. 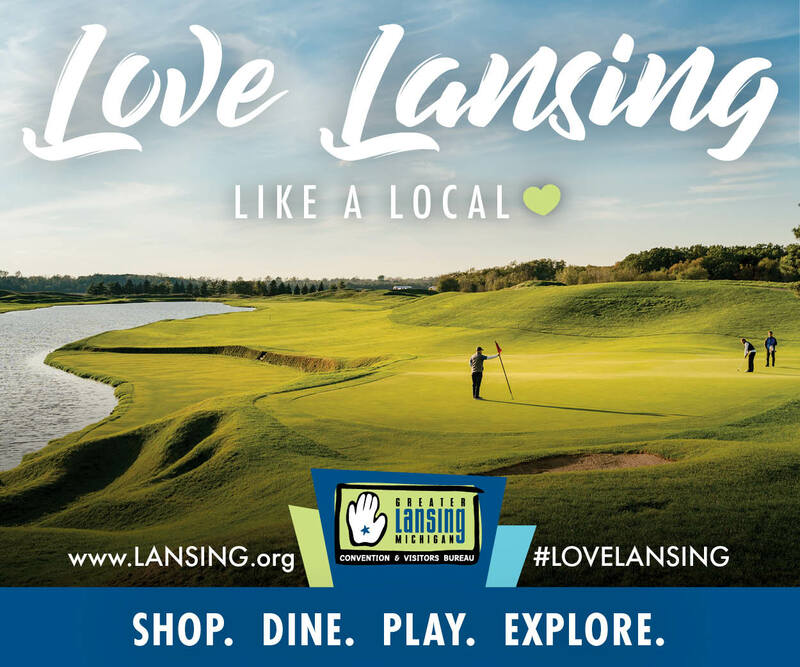 “We are very lucky to have one of the best conditioned golf courses (designed by Pete Dye) in the United States – including all private and public golf courses,” began PGA Director of Golf Jeff Williams. “So we feel we have a very unique venue that spoils you equal to any private country club. Pete Dye was asked recently ‘which golf course you have designed could host a major championship that never has hosted a major and he answered Brickyard Crossing,” concluded Williams. Brickyard Crossing also utilizes Dye’s signature railroad ties as well as large slabs of concrete along creek beds. The concrete was actually recycled from inside the race track once the Speedway went to more modern safety precautions. Within Brickyard’s expansive clubhouse resides the Indianapolis Motor Speedway Museum, the perfect two hour diversion in between rounds during your trip. “Our Indianapolis Motor Speedway Museum is open over 360 days per year 8a.m. to 5p.m. I recommend giving yourself between one to two hours that includes viewing a short movie about the great history here,” explained Williams. The Fort GC is always in the Top 10 on a variety of best in state lists since opening in 1997. Pete Dye took a 238-acre tract of land that was made for golf and carved his indelible style into each memorable hole. From my perspective, The Fort shows off a kindler, gently version of Pete Dye and it is much appreciated by mid and high handicap players. “When golfers play The Fort, they are typically struck by the rare topography that we have,” stated John Swan, Director of Golf at The Fort. 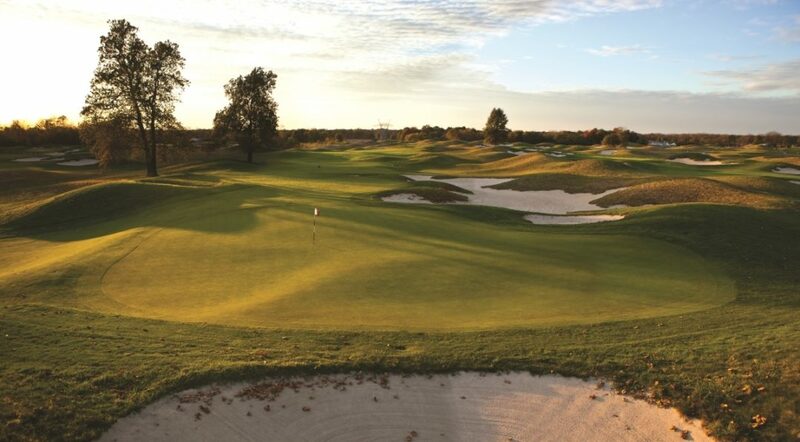 “While most of the great courses in the central Indiana area are built on flat or rolling terrain, The Fort has the great advantage of being built on some very hilly terrain with a large gully that runs through the property. A majority of the holes are tree lined and Pete Dye did a masterful job of routing the course,” ended Swan. Owned and operated by the State of Indiana, the 7,148 yard, par-72 layout also features Stay and Play Packages with the adjacent Fort Harrison State Park Inn. 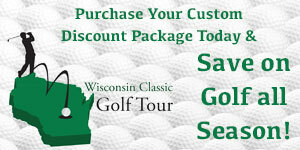 For more information, please visit www.thefortgolfcourse.com. The third course on the trail, Plum Creek resides in Dye’s hometown of Carmel, not too far from Crooked Stick CC which hosted the 1991 PGA Championship and this year’s BMW Championship. This 6,802 yard, par-72 layout features strategically placed bunkers, challenging green complexes and a bevy of Pete Dye trademarks designed to make you think before pulling the club back. Their par-3, par-5, par-4 finishing stretch features water on all three and provides a “Dye”-namic end to your round. For more information please visit www.plumcreekcc.com. Hamilton County is so much more than a trio of properties on the Pete Dye Golf Trail, it’s about a series of courses that stand on their own as well as within the collective. MGM’s favorite non-Dye track is Purgatory GG, located in Noblesville, IN. The Ron Kern design opened in 1999 to rave reviews and to this day offers one of the purest golf experiences in the Midwest. “We are very fortunate to have a dedicated golf course with no homes plus each hole is designed to have its own privacy from other players on the course,” stated Jon Stutz, Purgatory’s Director of Golf. “We also take pride in our challenging green complexes that putt true but will test all level of players. Finally, our holes are uniquely sculptured by fantastic bunkers and fescue grass that frame nearly every hole,” ended Stutz. Amazingly, Purgatory offers the longest set of tees (7,754 yards) and the shortest (4,562 yards) in the Hoosier State, a fact that Guinness might want to add to their record book. No matter which of the six tee boxes you choose to play from, you will be greeted by an immaculate course that harkens back to the days of The Legend of Bagger Vance as it’s just you and the field. This is links-style golf at its finest as every fairway is lined with waist-high prairie grass, and most greens can be accessed via ground instead of air. Finally, a round at Purgatory would not be complete with a lunch inside their 30,000 square foot log cabin clubhouse and a piece of merchandise with their iconic logo. In conclusion, in 2016 golfers have the perfect excuse to speed on over to Indianapolis and more specifically Hamilton County for an amazing golf getaway thanks to the playing of the BMW Championship in nearby Carmel. Once there, you will find a stunning collection of golf and attractions buoyed by their ultra-friendly residents. For more information on planning your trip to Hamilton County, log on to www.visithamiltoncounty.com.